A few years ago, if you wanted to buy a decent microphone you had to pay quite a big amount of money. But nowadays, as the technology progressed you can get a good quality for a very low price. In this article, we focus on microphones that are between 20 and 30 dollars but offer sufficiently high-quality to be considered as a good investment. How to choose your microphone? 30$ is not much, but sometimes you have to buy additional accessories. Some of these mics come as a full kit, and another offer just a stand. So be sure that your pick comes with the required stuff. There are 3 main microphones types: USB, 3.5 mm and XLR. XLR – Professional recording studios use this type of microphones. That doesn’t mean that every mic that offers the XLR connection will be good for this type of job. But even the cheap XLR mics have better sound quality than 3.5 mm or USB and can be used in semi-professional recordings. 3.5 mm – This type of microphones can be plugged both into a computer if it comes with a 3.5 mm plug or a smartphone. USB – Very common type of microphone – just plug it into your computer and start using it. 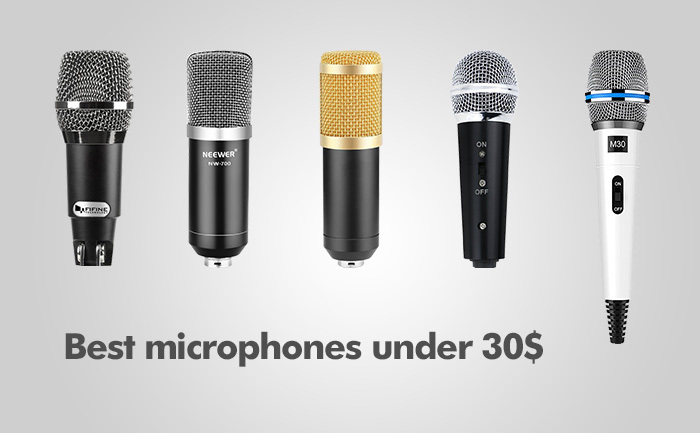 Despite the fact that you pay less than 30$, some of the microphones come with additional accessories, such as pop filters, arm stands or tripod stands, and shock mount, but it’s not always the case, so check before you buy. This is the list of the best speakers, you can find on Amazon between 20 and 30 dollars. While creating this list we considered popularity, ratings, and features. This microphone, next to the BM-800 model, is the most professional of this list. While other mics use 3.5 mm or USB plug, this one uses the XLR port. This means that you need an additional power. You have two options here. You will either need an audio interface, such as Behringer UM2 or Focusrite Scarlett 2i2, or phantom power supply that you can buy on Amazon. It comes with many accessories like arm stand, table mounting clamp, shock mount, pop filter and 3.5mm male to XLR female cable. The recording from this microphone sounds very clean. For this price, you won’t find anything better. If you don’t own the XLR audio interface, you have to pay additional 20$. But even then for less than 50$, you get amazing microphone kit that will give you a professional sounding audio. Even after you decide to buy a better microphone, you don’t have to buy additional accessories, so this option is definitely a good deal. This microphone is good for someone who just starting their adventure with the voice and instrument recordings. The whole package (not only microphone) comes in 3 color schemes: black, blue and white. This is the second XLR microphone on this list. It is very similar to NW-700 and comes with the following accessories: arm stand, table mounting clamp, shock mount, pop filter. Because it has the XLR connector, you need phantom power (48 volts) to get the most out of this mic. If you are just starting to work with the voice or instrument recordings, this is a good pick. The microphone comes in two versions: black and blue. This is a great compact microphone excellent if you want to carry it with your laptop or smartphone. If you like to sing songs with your iPhone you won’t be disappointed. It’s also good for gaming, where it’s nice to have a decent sound but not at recording studio level. It’ll be better than a headset microphone. The sound it collects is clear and without noise. It comes with a few accessories, such as tripod stand and adapter to split a signal between microphone and headphones, so you’ll be able to use both at the same time. This microphone is good for tasks such as chatting, gaming or Skype conversation. This is a great option for people who want light, compact microphone, without an additional power that is required for XLR mics. This kit comes with a complete package: microphone, 160-degree rotatable tripod stand and pop filter and adapter, which allows you to connect the microphone and headphones at the same time. This is a very compact set that is not designed to be used in recording studios, but it’s light, simple and will be great for less demanding tasks, such as Skype or gaming. In order to record a clean sound, it comes with noise-canceling technology. It comes in only white version. This is the only USB microphone on this list. It’s easy to use because it’s plug-and-play device. This means that it’s ready to use after connecting to a computer via USB, and there is no need for an external 48-volt phantom power. It comes with 6 feet long USB cable and a tripod stand. There is a control knob on its side, where you can change the volume of the microphone, or even mute it completely. It’s small, sturdy and very well made. If you are looking for a solid mic, this proposition from Fifine is an excellent choice for Skype or gaming. The voice from this mic is much clearer than from a microphone that you can find on a headset. These mics are not designed to be used in professional recording studios, but for semi-professional voice and instrument recording, the XLR microphones from this list can be sufficient. The rest of them is great for Skype, gaming or Youtube.